The Friday night pre-tournament meeting was held at Scheels and we were treated to a great meal. 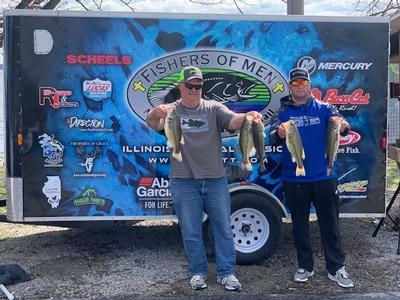 Saturday the anglers were blessed with a beautiful spring day with partly sunny skies with temps in the 60's with 10 mph winds. 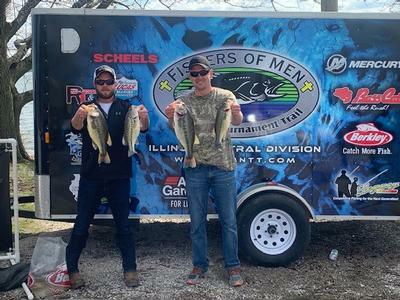 17 teams were competing for the 100% payout and some great incentives. 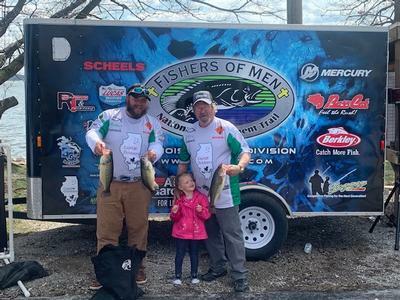 When the 3:00 rolled around all the anglers checked in with all accounted for with no penalties. 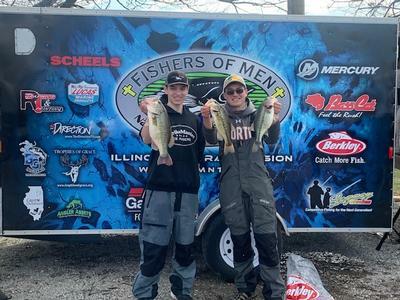 It seemed to be a tougher bite as the first few teams checked in with no fish, however the bags eventually began to grow. 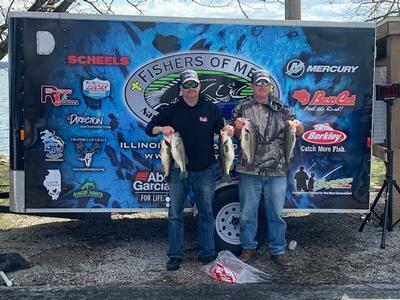 When it was all said and done it was the team of Kerry Malone and Jim Dietel who would be the victors with a stellar limit of bass weighing 18.37 lbs taking home 1st Place prize money including 1st in Bonus Bucks with $1387.50 and First Place hard ware. 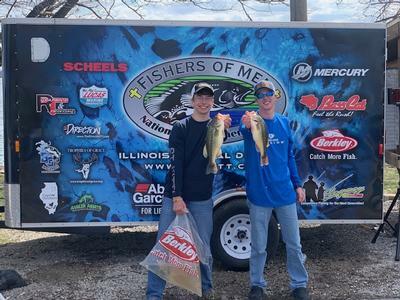 2nd Place was the team of Clay Reeves and Daniel Weikle with another great limit of bass weighing 15.81 lbs which included the Big Bass of the tournament weighing 4.97lbs. 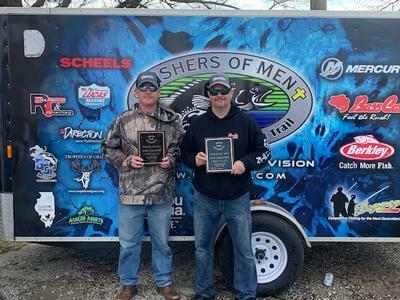 Clay and Daniel took home 2nd Place money, 2nd in the Bonus Bucks, and the Big Bass award totaling $982.50. 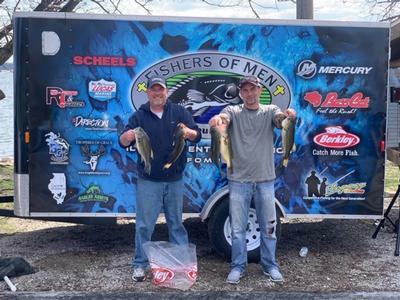 3rd Place was the team of Joe Digiavonna and Pat Cravens with 14.62 lbs, taking home 3rd Place money and 3rd Place in the Bonus Bucks of $455.00. 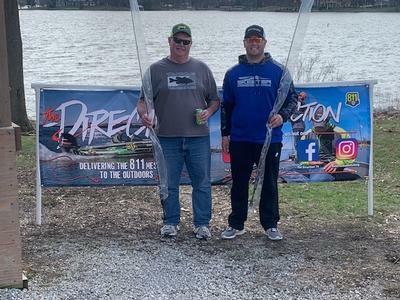 All teams that finished out of the money were entered into a drawing for two custom 811 Denali Fission Rods sponsored by "The Direction TV" and the winners were Herb and Steven Rsuh who actually finished in 4th Place and just out of the money. 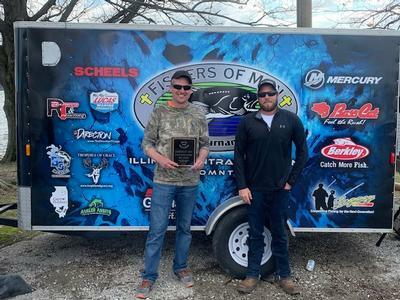 A special thanks to allour local sponsors Scheels, The Direction, Lucas Oil Products, Angler Assets, Capitol Outdoors, Ben Green Insurance, Trophies of Grace, RT Graphics & Printing. 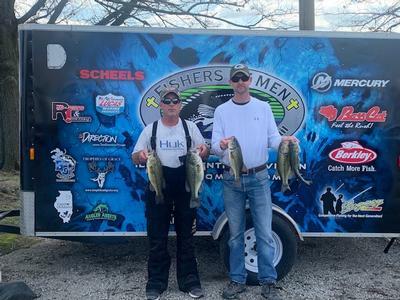 Our next event will be held May 4th at Glen Shoals in Hillsboro, IL. 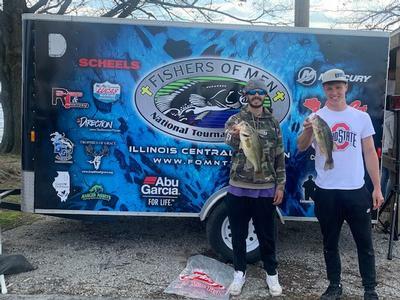 This will be a one day event with no Friday Night Pre-Tournament meeting. We will launch out of the South Ramp at Safe light (30 Min Prior to Sunrise) and weigh in at 3:00PM. Afterward there will be free food and drink with a devotional message immediatley following and then prizes awarded thereafter. 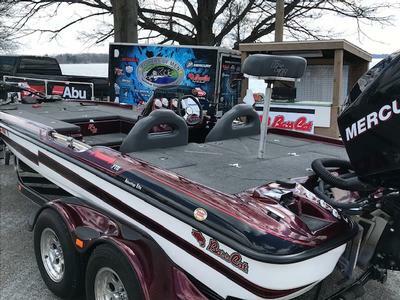 Please make sure you send in your membership fee/ entry fee by Friday April 26 to avoid the $25 Late fee which will be in effect. 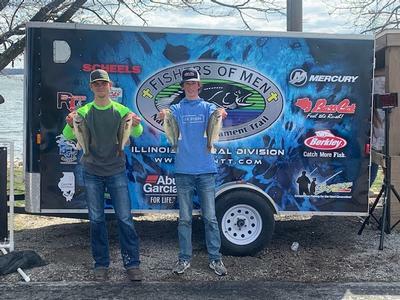 I belive there is a ramp fee for this lake so plan accordingly if you are prefishing.